Narrow Field. Deep Space Imaging Missions. Typically used for LRGB Imaging. 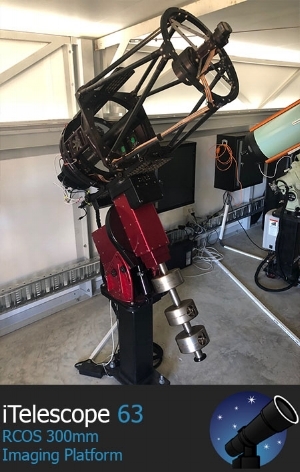 T63 is a 300mm open truss RCOS telescope based at Bathurst in Australia. It has a selection of LRGB imaging filters. Its teamed with a sensitive FLI Microline Monochrome CCD. The Ritchey-Chrétien optical design is a specialized Cassegrain telescope designed to eliminate coma, thus providing a relatively large field of view . T63 is a prime imaging platform in the southern hemisphere with exceptional optics . Narrow Field. Deep Space Imaging Missions. Typically used for Color Imaging. T64 is a 300mm open truss RCOS telescope based at Bathurst in Australia. It has a single shot SBIG Color CCD installed. The Ritchey-Chrétien optical design is a specialized Cassegrain telescope designed to eliminate coma, thus providing a relatively large field of view . T64 is a prime imaging platform in the southern hemisphere with exceptional optics . Very Wide Field. Deep Space Imaging Missions. Typically used for Color Imaging. T68 is a 280mm Wide Field RASA telescope based at Bathurst in Australia. It features an ultra fast f2.2 optical design coupled to a large format single shot ZWO Color Camera. With only a 620mm focal length, exposure times are greatly reduced when compared to more traditional telescopes. Making T68 ideal for one shot color comet imaging. T68 is a prime imaging platform in the southern hemisphere with exceptional optics .